We have been interested all along in figuring out the relationship between people and their environment. In the last few sections, we looked at various ways that the humans can affect their environment - as in planting crops - and ways that the environment shapes human behavior - as in the choice of where to place a house or village. It has also been suggested that in some cases - like with deforestation - humans both cause a change and are simultaneously affected by that change. In this section, we look at another process that is difficult to break down into simple cause-and-effect. There is more talk in the news every day about the idea of "global warming." The term first emerged in the 1960s, when scientists from a many disciplines were asked to describe potential environmental risks the <?xml:namespace prefix = st1 ns = "urn:schemas-microsoft-com:office:smarttags" />United States would face in the years to come. While the phrase "global warming" is by far the most popular way to describe the changes observed over the past century in the global climate, it can also be misleading, and may be responsible for some confusion. For many of the same reasons that "land cover change" was preferable to "deforestation," a better phrase to describe what is occurring worldwide might be "global climate change." This term reflects the fact that while average temperatures are rising worldwide, there are in fact some places on earth where the average temperature will decrease over a small region. Meanwhile, some places may grow dryer, others may see more rain, and so on. The reason for all of this is that changes in global weather patterns and other intricate and interconnected global systems caused by this overall temperature increase may set up new local weather patterns. One of the most serious impacts of global climate change being predicted is an increase in extreme weather events of all types, as well as in the severity of these events. It is unlikely that a single region of the earth will experience all of the extremes, but many places may experience one or more of them, creating new challenges for the residents there. Is there any evidence of this in Nang Rong? The safest answer to this question is maybe. With so many factors to consider it is risky interpreting a single change as evidence for such a massive shift as global climate change. This is why the scientific researchers who study climate change amass giant collections of many different types of information and measurements before drawing any generalizations or conclusions. In other words, not all claims are of equal value. A claim based on a single source of information is typically not enough to outweigh those based on multiple sources of information that are all in agreement with one another. Nevertheless, simple measurements from Nang Rong are consistent with an overall picture of an increase in the variability of weather, and especially rainfall. Let's take a look. The graph below may appear familiar. 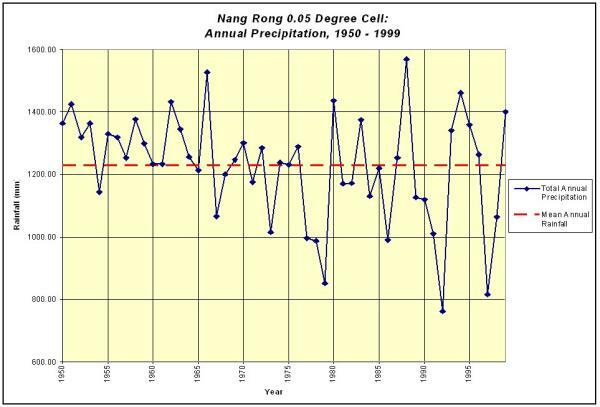 It is the same that was used in Section 3 on climate to show the yearly rainfall in Nang Rong District, and the average over many years. In that section, we determined both the high and low rainfall records and compared them to the average for the past 30 or so years. As is often the case, however, there is still more to be learned from the graph. The year 1975 divides the graph roughly in half. Do you notice a difference between the years before 1975 (to the left) and those after 1975 (to the right)? Recall from the Section 3 exercises that both the record high and low rainfalls have occurred since 1985. In fact, 7 of the 8 most extreme high and low rainfall years have occurred after 1975 and thus fall on the right half of the graph. Notice that Nang Rong has, in effect become both wetter and drier from year to year. A precise way to describe this trend is to say that the variation in total annual rainfall seems to have increased over the past 30 years. ABOVE: You can test your graph-reading skills by trying to describe the various patterns in annual rainfall over the years for Nang Rong. Need more practice? Try the exercises section. There is considerable debate, at least in the public sphere, about the extent to which global climate change is the result of the greenhouse gasses being added to the atmosphere through human activity. But whether one believes that we have control over global warming or not, the reality is that even if people ceased all emissions of carbon, methane, and other greenhouse gases today (an unrealistic assumption in the extreme), scientists mostly agree that it would be 10 to 20 years before we experienced any relief. This is because there is a time lag between when greenhouse gases are emitted and when they are finally taken back out of the atmosphere through natural processes. (One of the most important "natural processes" is carbon-binding, which occurs every second of every day almost everywhere you look. Plants absorb carbon from the atmosphere in the form of carbon dioxide and lock it up in their tissue. The other side of this coin is that deforestation is a major contributor to the increase in greenhouse gasses). Given that climate change will almost certainly occur over the short-term for decades to come, it is absolutely essential that we continue to research the local effects of global changes and the impact of these changes on human populations. This is an interesting new direction that we are currently taking our research, by simulating changes in the overall weather and climate conditions in Nang Rong District and observing how these shifts may impact the agriculture, economy, and population of the region. Predicting both the types of local changes resulting from global climate change and their potential impacts requires great familiarity with every aspect of a place and its people. 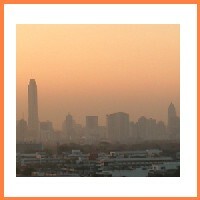 As you have learned, the Nang Rong Projects provide an ideal collection of information on just such a broad and relevant range of topics. It is our hope that we can predict some of these changes before they occur, thus giving the residents of Nang Rong more time to develop successful responses. ABOVE: The complex and finely-tuned system of rice agriculture developed in <?xml:namespace prefix = st1 ns = "urn:schemas-microsoft-com:office:smarttags" />Northeast Thailandover hundreds, and possibly thousands, of years is able to take advantage of whatever rainfall occurs. In general, more rain results in more rice, but this may be true only up to a point. 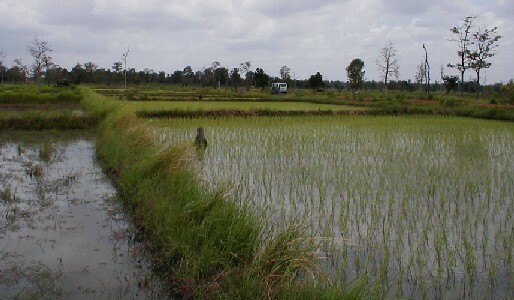 The timing of the rain throughout the wet season is also an important factor in controlling how much rice is produced.